33 ¼ x 39 1/8 in. 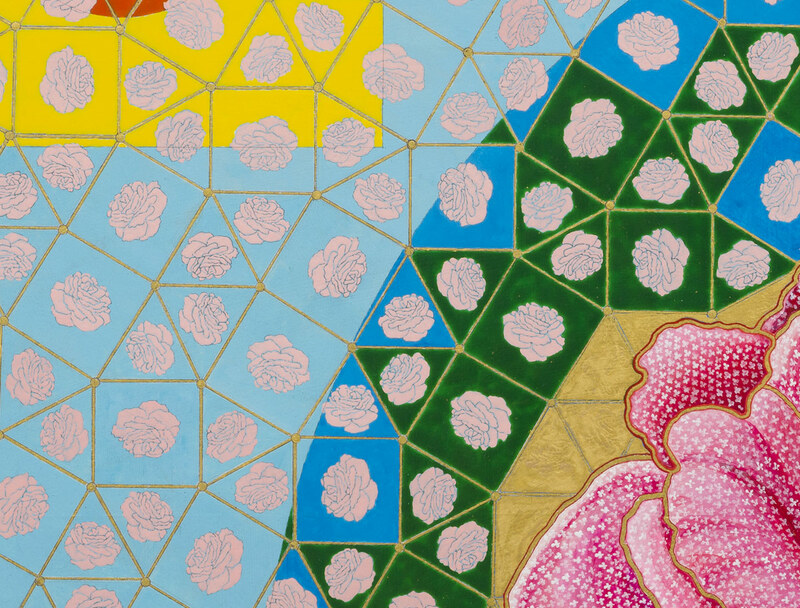 The concept behind this work was first developed in Rain of Celestial Flowers, which served as a study for this painting (see Rain of Celestial Flowers for descriptions of the forms’ symbolic representations). Not only is there a greater complexity of imagery from that of the study, there is also an infusion of visual elements akin to traditional mandala depictions. Mandalas often feature a deity at the center surrounded by a retinue of beings that are painstakingly rendered within elaborate rectilinear and circular constructions. 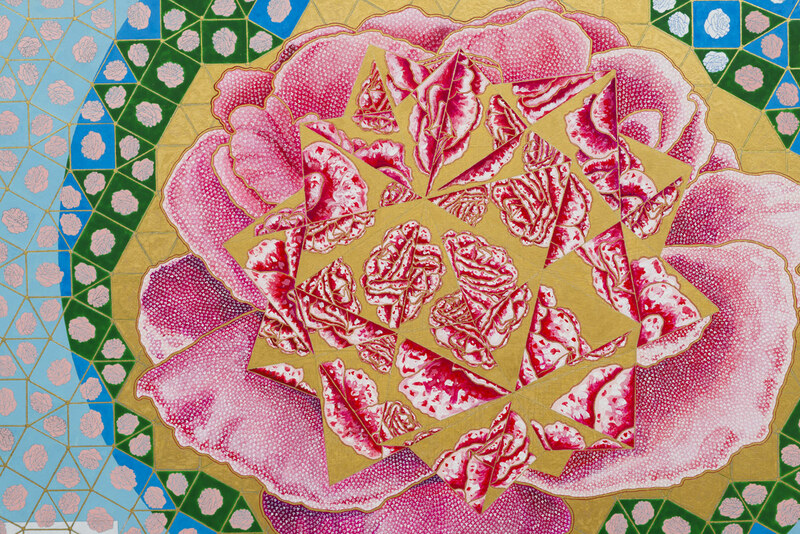 In One Hundred Trillion Concentrations, Wudl has integrated similar visual devices: The composition builds exponentially around a flower with a faceted gem at its core. This central form represents consciousness itself. -The infinite variety of meditation practices and the infinite nuances within the specific meditation practices that accommodate the temperamental differences of all individuals. -The continual return and recommitment to attention during each period of meditation due to the uncontrollable stream of mental activity that interrupts concentration. -The continued return and sustained attention and determination to meet the challenge of initiating the painting and carrying it through to its conclusion. For Buddhist practitioners, mandalas serve as a visual aid to meditation. 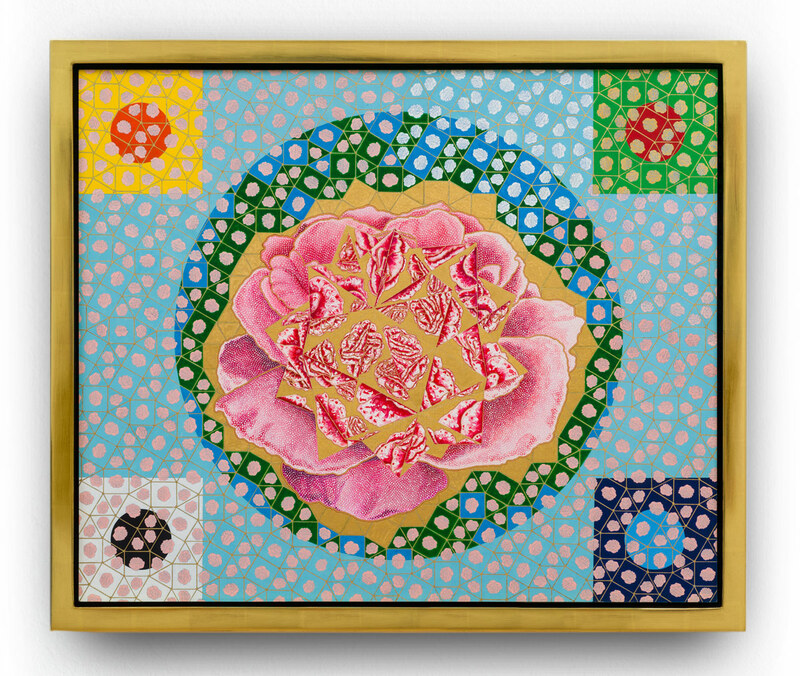 However, in conceptualizing this work, it was not the artist's intent to produce a tool for meditation, but rather to create a visual response inspired by mandala imagery, the descriptions in the Avatamsaka Sutra, and the significance of meditation in his daily practice.